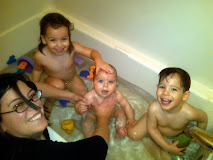 The tykes made it through their 10th month - and Husband and Mommy, Esq. did too. In some ways it was easier than the 9th month since Ned stopped whining 24/7 because he learned to crawl and pull up. But of course this month included two hospital stays for my Sweet P. The 10th month also marked the highest water point in our constant "juggling" of two careers with two kids. As you can see from this chair photo we gave the kids haircuts. Unfortunately Ned's makes him look a bit like Hitler and Penny's bangs are totally my fault but I think she looks like a pixie. Dear Ned, We are so happy you learned to crawl and as soon as you figured it out you have been into everything but don't worry, Daddy has put up gates to protect you...and his electronics. You wake up early (5:30 am) every day chattering around and looking forward to trying out your new skills. Sometimes you try too hard to play in Penny's space but I know you can't wait for her to join you in moving around. Dear Penny, You have been incredibly strong and brave during the hospital stays and million doctors appointments. I know you don't like to have the tape and oxygen on all the time and hopefully we can figure something out for you soon. You desperately want to crawl but refuse to spend any time on your belly so I don't think that is going to work out so well for you. Grandma and Daddy told me you said "mama" but I haven't heard it yet. Ds, Bs, Ws and Ms are always at the tip of your tongue even if food doesn't make its way in so often. You have become my little girl - holding your hands up every time you spy me. It's nice being your mom. how is it possible that they got cuter?? Love the haircuts! Such cuteness my heart hurts. What adorable, Sweeties! Penny's haircut is making me rethink whether I should trim S&J's bangs. I know it's been a rough month. Hang in there and hope things get better soon! I think the haircuts are cute. I'm jealous as we've never even cut my 2 year old's hair. Not enough of it. Good luck with the juggling. It can be impossible sometimes. I look forward to seeing how you far with this, esp. at the year's end and billable hour totals...That's always my nemesis. POST REQUEST: Can you post all of the chair photos in a row? I want to admire the progress of the cuties growing up. where does the time go? wasn't it just a little while ago that we were propping up your cankles while watching the Olympics? that was a whole year ago, I can't believe it!